Waltham resident Brian McCormick, is being honored by The Charles River Conservancy for being the most active and committed conservancy volunteer. Brian has worked on projects of all kinds—from tree pruning to bulb planting—always giving a phenomenal effort. Since he began volunteering with the Conservancy Brian has served at 35 events. The Charles River Conservancy organizes 2,000 volunteers every year at locations along the Charles from Watertown to Boston Harbor. Volunteers improve the parklands by planting flowers, repairing park benches, trimming brush, and removing invasives, doing their part to help the Conservancy fulfill its mission to make Charles River Parklands more active, attractive, and accessible. In addition to mobilizing volunteers, The Charles River Conservancy is also working on several major projects. Love that dirty water? Well, the Charles River water might not be as dirty as you think. Since 1995 efforts by federal, state, and local agencies and environmental advocacy organizations have improved water quality in the Charles River from a United States Environmental Protection Agency (EPA) rating of a D to a B+. Today, many areas in the lower Charles River meet the state public health standards for swimming much of the time. Cyanobacteria (also known as blue-green algae) blooms in the lower Charles are one of the environmental issues posing a risk to swimmers. Algal blooms turn the water bright green and emit cyanotoxin, which is harmful to humans and animals that come in contact with it. Algal blooms can be triggered by high nutrient levels in the water, warm temperatures, and low stream flow. These are conditions that are monitored closely by local organizations such as the Charles River Watershed Association (CRWA), as well as the Massachusetts Department of Public Health (MDPH) who have a grant from the US Center for Disease Control (CDC) to monitor and study Cyanobacteria in this area of the river. Most algal blooms in the lower Charles River occur downstream from the Harvard Bridge (Massachusetts Avenue), especially in the vicinity of Community Boating next to the Edward A. Hatch Memorial Shell (Hatch Shell). This past August, there was a persistent Cyanobacteria bloom extending from the Harvard Bridge to the locks entering the Boston Harbor, resulting a month-long MDPH public health advisory about coming in contact with the water. Public health advisories are typically issued by municipalities, but MDPH also typically posts advisories relevant to the Charles River that are available online. Recently, the CRC’s director of projects, Jason Lederer and Northeastern University Co-op, Nathaniel Van Cleve accompanied Tom Faber of the EPA and Roger Frymire, a well-know water quality volunteer and advocate, as they conducted split sampling at the MIT community boating dock. Faber and Frymire collected samples by hand near the dock and serviced the EPA water-monitoring buoy stationed nearby in the cove. The EPA buoy suspends a series of water-monitoring instruments that, among other things, use x-ray florescence to detect levels of Cyanobacteria in the water column. The data collected by the buoy can be compared with the physical water samples to better understand the accuracy of the buoy and its potential for forecasting future algal blooms. Such forecasting methods can be useful in helping notify the public when a potentially dangerous condition exists. The Charles River Conservancy advocates for the public use of the lower Charles River and its parklands and restoring public swimming to the river is one of our top priorities. Already the Charles River Swimming Club and the CRC host an annual one-mile swim race in the river and hope to hold more regular swimming events in the future. With help from dedicated individuals like Roger Frymire and Tom Faber, as well as the Massachusetts Department of Environmental Protection (MassDEP), MDPH and CRWA, we are working to better understand how to restore public swimming to the river. 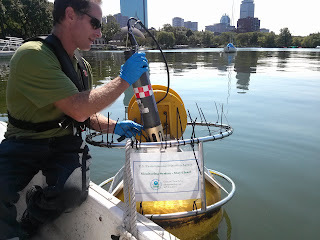 For more information about Cyanobacteria in the Charles River visit http://www.crwa.org/water_quality/algae.html. To learn more about the Charles River Conservancy’s efforts to restore swimming please visit our webpage, http://www.thecharles.org/swimmablecharles.html. Iconic Boston skateboarding landmarks will be recreated in the Charles River Skatepark after its developers met with local skaters to collaborate on the design of the long-awaited park. Developers of the Charles River Skatepark unveiled their design plans Monday after hearing from the public and local skateboarders at two public meetings. The proposed design, created by design firm ASD-Stantec, replicates iconic Boston skateboarding landmarks, such as the volcano-shaped mounds at the former Boston City Hospital, in hopes of giving the park an authentic Boston feel. The Charles River Conservancy, which is building the park, hosted two public meetings to discuss design plans for the 40,000 square foot park planned for the North Point Park in East Cambridge. When completed, it will be the largest outdoor skatepark in New England. A rendering of the proposed Charles River Skatepark. ASD-Stantec also worked with professional skaters and Massachusetts natives Andy Macdonald and Anthony Shetler. The conservancy has raised $2.5 million to build the park under the ramps of the Leonard P. Zakim Bridge. Once the skatepark is built, the Massachusetts Department of Conservation and Recreation, which manages North Point Park, will take over maintenance and management responsibilities. ASD-Stantec plans to make final adjustments to the design, including landscape, spectator, and drainage elements, and begin the permitting process over the next several weeks. At Magazine Beach, Cambridge’s second-biggest park, clean-up crews often find piles of garbage–and sometimes syringes. A former powder house at the park is now structurally unsound and scrawled with graffiti. But organizations including the Department of Conservation and Recreation, the Cambridgeport Neighborhood Association and the Cambridge Historical Commission are working together to figure out how and when to transform the park into a place Cambridge can be proud of. This initiative recently received funding in the form of $25,000 from Community Preservation Act funds and $50,000 from a DCR partnership to study how to shore up the powder house roof and determine how much it will cost to completely revamp the powder house. The study will build on research undertaken in 2011 and 2012 into the history of the powder house, as well as on a Cambridgeport Neighborhood Association survey of residents that’s slated for release this fall. Cathie Zusy, a Cambridgeport Neighborhood Association board member and a leader in the efforts to revitalize the park, said she thinks the surveys are the first step towards finding funding and a solution for the area. Zusy said she’s been interested in Magazine Beach for about a decade, but began campaigning for change in earnest in 2010, after she and Cambridgeport Neighborhood Association president Bill August organized a clean-up of the site and received a groundswell of support. The powder house at the park was built in 1818, said Nina Cohen, one of the two historians who researched the powder house in 2011 and 2012. The powder house fellinto disrepair in the 1880s, and the famed Olmsted brothers converted it into a bathhouse in 1899. From 1900 to 1910, the area was actually a beach, and drew many Cantabrigians and Bostonians to swim in the Charles on hot summer days. But in 1910, the Charles River Dam was built, which led to an increase in pollution from the Brighton slaughterhouses and Watertown factories. The beach was officially closed in the 1940s, and the powder house was converted to a storage shed in the 1950s. Charles Sullivan, Executive Director of the Cambridge Historical Commission, said his organization is interested in the property because of the historical significance of the powder house. Several officials said they supported revitalizing Magazine Beach, including Cambridge Director of Community Planning Stuart Dash and State Rep. Marty Walz. Zusy and August said they have numerous potential ideas for the park, including turning the powder house into a stand that sells healthy snacks and coffee; holding a farmers market there; renting out kayaks and canoes; hosting programs and tours that meet at the park; and installing interesting lighting or an interactive exhibit. “There are so many things it could be, and I feel like things are just about to take off,” said Zusy. Zusy said she wants to involve high school students in the process of revitalizing Magazine Beach. She said the park is a popular drinking spot for area teenagers, and she wants them to help facilitate change there so they continue to feel welcome at the park. “I think it’s important that people feel ownership of Magazine Beach,” said Zusy. While these groups are working on revitalization efforts, other groups such as the Charles River Conservancy are focusing on clean-up efforts now. Danielle Stehlik, Volunteer and Outreach Coordinator at the Charles River Conservancy, said her organization regularly brings volunteers to pick up trash, paint benches and trim plantings at Magazine Beach through a partnership with the DCR. Stehlik said volunteers usually enjoy working at Magazine Beach because it’s easy to see improvement from start to finish. But sometimes, volunteers are fighting a losing battle. “Last year the state brought in a crew and cleaned the whole powder house, but now the graffiti is back again,” said Stehlik. One group not as enthusiastic about revitalization efforts is the Friends of the Charles River Geese, a non-profit organization dedicated to defending a group of white geese that live in the parklands lining the river. The geese group sees revitalization of Magazine Beach as potentially detrimental to the river’s geese population. Wayne Petersen, Director of the Massachusetts Audubon Important Bird Areas program, said the white geese are domesticated animals, so their fate is largely tied to the people who maintain their lifestyle by feeding them. Zusy said while she sympathized with animal lovers, she doesn’t think revitalizing Magazine Beach will have a detrimental effect on the geese. “I think it’s very important that we have wild places and habitats that are preserved…but I don’t think our efforts to preserve and stabilize and find new uses for the powder magazine and for the park are contrary. I don’t think we’re in opposition. I don’t think we’re harming the white geese by bringing more people to enjoy this open space along the Charles River,” said Zusy. When Jon Puz gets out of work late and goes for a run along the Charles River, the last thing he wants to worry about is getting hit by a car when crossing through the busy intersections that separate the trail connectors. Unfortunately for Puz, and for cyclists and pedestrians who utilize the path that winds along the water in Boston, that problem is all too real. “I have never been hit, but I have friends who have been hit. It’d be nice to run without having to stop or cross the streets, and I am sure people driving cars would like to drive without having to wait for pedestrians and cyclists,” said Puz. To try and make outdoor activities safer for everyone, Puz, a member of the Cambridge Running Club, joined an effort started by the Charles River Conservancy to push for the construction of underpasses on several bridges along the river, which would allow runners like him to travel along the trails without interruption. “It would make so much sense for everyone. The ease and convenience of it would be really nice and it would be much safer,” he said. Since 2010, members of the Charles River Conservancy, a nonprofit citizens advocacy group, have been spearheading efforts to have the underpasses added to a number of bridges that arepart of the state’s “Accelerated Bridge Program,” a series of fixes funded by federal dollars to revamp crumbling infrastructures all over Massachusetts. The CRC has focused on the bridges scheduled for repair along the Charles River Basin in Boston, including the Anderson Memorial Bridge, River Street Bridge and the Western Avenue Bridge. According to Renata von Tscharner, the CRC’s president, the state missed a prime opportunity to add an underpass on the Cambridge side of the Boston University Bridge, during its recent construction, but the group is hopeful they will insert the tunnels into the next round of bridges. They are the Anderson Memorial, the Western Avenue and the River Street bridges . Having underpasses at these bridges will create an uninterrupted pathway of almost 8 miles along the river, she said. “When these next set of bridges, when those came up, we started to tell [MassDOT] to look at this as a great opportunity to incorporate the underpasses,” she said. Beyond attending MassDOT hearings and meetings about bridge reconstruction, members of the group reached out to Boston Mayor Thomas Menino for support. According to a spokesman from Menino’s office, the mayor urged Boston Transportation Commissioner Tom Tinlin to write a letter to MassDOT officials, throwing support behind the underpass proposals. “The mayor approved and had Commissioner [Tinlin] sign a letter that stated we would like to see the design to allow for an underpass to create one contiguous bike lane around the Charles, and make it so cyclists would not have to cross streets in general traffic,” said Spokesman John Guilfoil. Von Tscharner said over one-thousand letters were even sent to Governor Deval Patrick, urging him to release funds allocated in the recent transportation bond bill with an amendment that specifies the underpasses. “More letters are coming his way. Now we want to meet with various appointed officials to make sure all the parts of the administration work together to make this happen,” she said. According to state officials from MassDOT, the underpasses aren’t going to be showing up anytime soon, and runners like Puz and members of his club will have to continue dodging cars when going out for a jog. “The request for underpasses was something MassDOT took a look at but the two principal issues we’d run in to would be time and money. Taking these bridges out of the ABP to design underpasses would mean we’d have to find funding elsewhere,” said Michael Verseckes, spokesman for MassDOT. The denial of underpasses comes at a time when MassDOT is pushing for a “Mode Shift to a Healthier State” and holding conferences on getting more people out on foot and on bikes. Despite MassDOT’s stance on the bridge reconstruction, which they say is due to time and money constraints, von Tscharner and the Conservancy will continue to push for a piece-meal attempt at getting the underpasses put in. Von Tscharner said they group has figured out a way for engineers to change the designs of the bridge reconstruction so that space could be allocated for underpasses after the fixes for the Accelerated Bridge Program are made. Puz and others from Somerville and Cambridge have even enlisted the help of their fellow runners. A website was set up providing information about the push by von Tscharner and the Conservancy, rallying for the changes in the bridge designs before the state gets to work in the spring. To sign the petition, visit: tinyurl.com/CRunderpasses.